Intertops Poker and Juicy Stakes are sending another online satellite tournament winner to an exotic location to play in a €500,000 GTD poker tournament. A third round of €500K Malta Poker Festival satellite tournaments starts today and continues until the Final September 30th. Contenders for the Maltese throne can win their way to the satellites Final in $3 Step 1 qualifiers held four times daily. Intertops Poker and Juicy Stakes are sending another online satellite tournament winner to an exotic location to play in a €500,000 GTD poker tournament. A third round of €500K Malta Poker Festival satellite tournaments starts today and continues until the Final September 30th. Step 1 qualifiers are held four times daily. 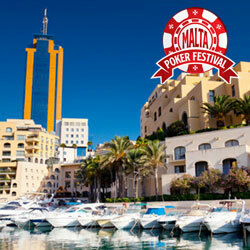 The Malta Poker Festival is held at the Portomaso Casino, right in the heart of Malta’s vibrant night life. The $2500 prize package covers the winner’s buy-in to the Malta Poker Festival Main Event, Day 1C. The Intertops team will take the winner to an exclusive MPF VIP party. Further information on Malta Poker Festival online satellite tournaments is available at Intertops Poker and Juicy Stakes Casino . Intertops Poker and Juicy Stakes Casino dominate the busy Horizon Poker Network, welcoming all kinds of players from all over the world.